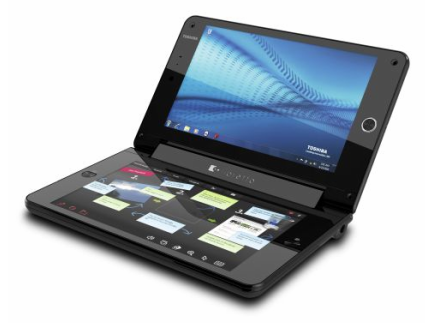 Toshiba have recently announced a new Ultra Mobile Device (UMD) to celebrate Toshiba's 25th Anniversary of Laptop Innovation. The libretto W100 Demonstrates a Next-Gen Ultra-Mobile PC Design With Full Windows 7 Functionality. The libretto W100 consists of 2 hinged 7 inch LED LCD touch-screens and can be used in a traditional laptop configuration with one screen being used to provide a virtual keyboard. The 'keyboard' provides vibration feedback to give a physical response when keys are pressed. 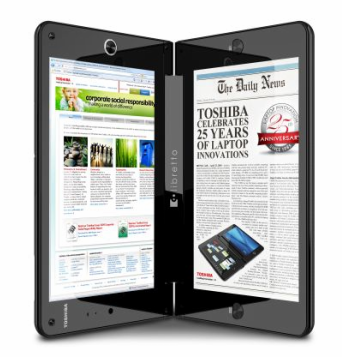 Alternatively, you can use it vertically which may be more convenient for reading eBooks. Details from the Press Release indicate that 'a limited number of libretto W100 Concept PCs will be available for purchase later this summer from select retailers'.